Elk are one of the largest species of land mammals in the world. 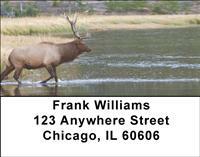 These elk, however, are less concerned about their importance and more concerned about finding a drink in the river. Stately and imposing, they're revered for their mighty antlers which can weigh as much as 40 pounds!